How to select a Motorcycle Helmet Radio? Having a motorcycle helmet radio equipped in your head gear helps not only with communicating with your passenger or fellow motorbike riders but it also keeps you company, especially during long hours of riding. The silence inside the helmet can be deafening; the isolation and the wind constantly accompanying the ears can be very sad and boring. Anyone who is going on long rides would want something that can fill their mind or have any interaction with other people. Good thing, there’s a so-called helmet radio that can be installed or pre-installed into your motorcycle helmet. These devices are small; it won’t take up too much space in the helmet. They’re also pretty powerful – they not only work as a communication device but also as an entertainment device that lets you listen to new or music alone or via your phone. 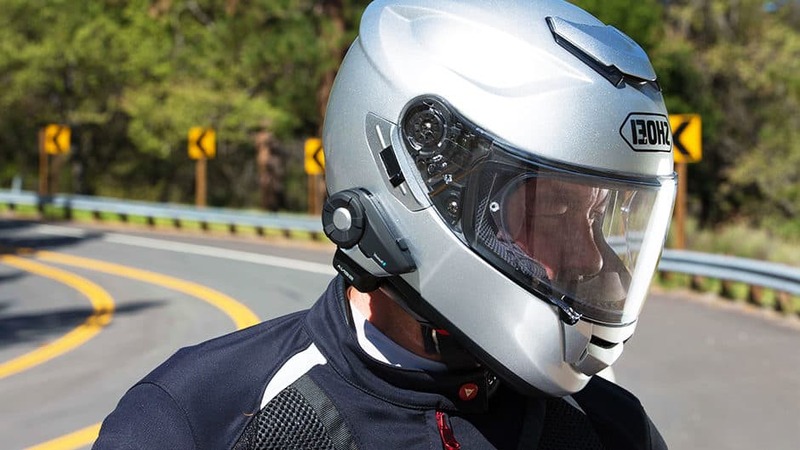 If you want to improve your riding experience, especially if you’re the type of rider who spends hours in transit, then you should definitely look at motorcycle helmet radios. Below we have listed some factors to consider when selecting the best one as well as products worth checking out. What are the factors to consider when selecting a motorcycle helmet radio? Bluetooth Wireless – If you plan to interact with fellow riders and your passenger, Bluetooth wireless technology is the way to go. Going wireless is the best option for helmet radios because they are hassle free and hands free, especially when you’re riding at high speed. Bluetooth allows you to pair with your phone and other Bluetooth enabled devices and helmets. Using this technology is great especially if you want to converse with someone riding very close to you. Bluetooth uses radio waves but only transmits information within a small area, called a Personal Area Network (PAN). Pre-installed – If you plan on using one helmet for every ride, then it’s best to purchase a helmet with a pre-installed radio or have it installed into your helmet to lessen the work of having to put and remove it every time you’ll go on a ride. It also minimizes risks of accidental drops as well as loss. Also because the radio and helmet are together as one, you won’t have to worry about forgetting where you have placed your radio or leaving it at home. Buying a pre-installed radio can be costly and you don’t really have much choice with the brand and type of radio installed. For this, it’s best to buy a helmet where you can easily install a radio. This way you have the freedom to choose your desired helmet and radio and easily piece them together. Safety – Considering that the helmet is built for safety, picking a radio for the helmet that is considered safe sounds ridiculous. But yes, you need radio that is safe by purchasing waterproof ones. Like the helmet, the radio will take a beating for being used non-stop for hours, especially during long rides. It will also be exposed to the changing weathers – heat, rain, and snow. 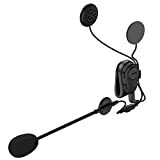 Noise Reduction – The radio, with its accompanying headset, should be able to reduce road and wind noise. Invest in a pair that comes with a noise cancelling speaker and microphone. This way, you’ll be able to hear the person talking on the other line as well as your music and podcasts clearly. Otherwise, it beats the purpose of having to wear them. Key Takeaway: A good radio is one that doesn’t require high maintenance. It should be able to hold off on its own while enabling you to talk to your passenger or fellow riders with ease as well as clearly listen to music and other forms of entertainment while you’re on the road. What are the best motorcycle helmet radios? 【Latest Bluetooth V4.1】: Advanced CSR 4.1 enables you to pair with most smartphones, iPhone and Android. Supports 2 bluetooth-enabled devices simultaneously with faster pairing speed. 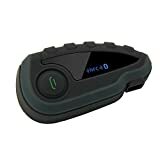 【Noise Reduction】: With CVC Noise Suppression technology focus on your favorite music and answer calls with clear stereo sound even at speed of 100 km/h. This communication radio fits all types and sizes of helmets and can be installed permanently through the tools provided in the kit. This has up to four hours of continuous talk time and 50 hours of standby. It comes with two stereos, a built-in microphone, and FM tuner. This Bluetooth v2.1 can reach up to 900 meters and pair with other Bluetooth intercoms of up to four persons. It comes with a stereo headset and microphone. You can have up to 12 hours talk time and 10 days standby. This runs on Bluetooth 3.0 and can multi-pair with up to four other headsets. Its appearance is very identical to the Sena SHM10D, except the Bluetooth function is more advanced. It also has 12 hours talk time and 10 days standby. NFC function: NFC bluetooth enables its convenient and fast connecting with itself, MP3, GPS and cellphones(Has NFC function). This radio supports up to five people multi-pairs and can reach up to 1,200 meters Bluetooth distance. It is waterproof and comes with a remote control handlebar, wireless communication, FM radio function, and safe auto-receiving phone calls. Key Takeaway: These are only some of the best motorcycle helmet radios in the market and there are still tons out there to try. The important features to check out are the number of pairings it can get, the maximum distance the Bluetooth can reach, ease of installation, and if it is weatherproof. Motorcycle helmet radios are not only good for communicating and conversing with your passenger or fellow riders hands free and with ease, but it is also a great tool for keeping you company during long lonesome rides. These radios are fairly affordable so you should really invest in one.